Comets, drones, marching bands and Spongebob Squarepants: Maroon 5’s Super Bowl half-time show had everything… except an emotional connection. The LA band delivered an enthusiastic, breathless history of their biggest hits – from This Love to Girls Like You – but unlike the copious pyrotechnics, their set failed to catch fire. They came closest with a low-key rendition of the ballad She Will Be Loved, performed in the middle of the crowd, as Chinese lanterns rose into the Atlanta skyline. As the song reached its climax, the lanterns revealed themselves to be drones – flying in formation to spell out the phrase “one love”. Behind singer Adam Levine, one couple wrapped their arms around each other and swayed, apparently oblivious to the fact they were being watched by millions. Levine threw himself into the show, dropping to his knees, bashing out guitar solos and running up and down the M-shaped stage – but the band tried to cram in too much material (nine songs in 13 minutes) to create a coherent, enjoyable show. It didn’t help that they had to make room for rapper Travis Scott, who arrived on stage by “crash-landing” in a comet, and local star Big Boi, formerly of Outkast, who drove onto the field to perform Kryptonite and I Like The Way You Move. The guests helped propel the show – Scott, in particular, doubled the energy on stage – but it’s notable that the most successful Super Bowl performers of the last decade, Lady Gaga and Prince, both rejected collaborators. 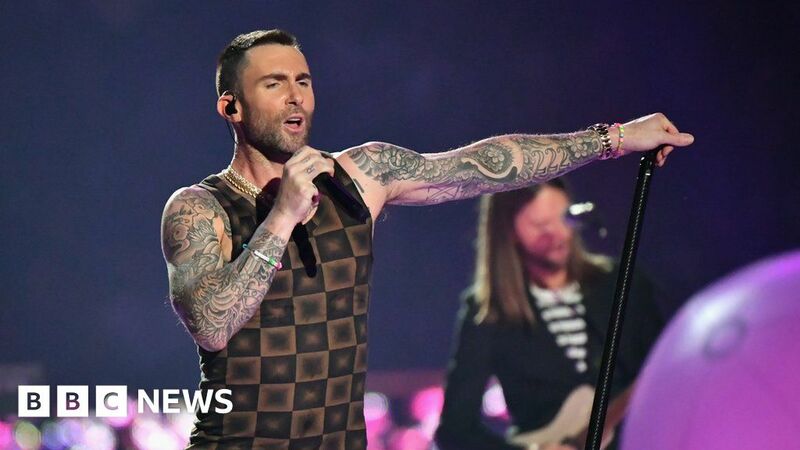 Maroon 5 closed their set with their biggest hit, Moves Like Jagger, as Levine stripped off his vest top and fireworks shot from the roof of Atlanta’s Mercedes-Benz stadium. They didn’t leave the stage defeated – casual fans will have been reminded why they’re still around and producing hits after 17 years – but neither will the show be talked about as an all-time classic. Why was Spongebob Squarepants there? During the show, a short clip of cult cartoon character Spongebob Squarepants was beamed across the stadium’s video screens – after fans pleaded for the character’s song Sweet Victory to feature at this year’s half-time show. For those who don’t know, Sweet Victory is a hair rock anthem that SpongeBob and the Bikini Bottom Super Band played for a stunned sports audience in the classic episode Band Geeks. A petition asking Maroon 5 to play it was launched after Spongebob’s creator Stephen Hillenburg died of ALS – also known as motor neurone disease – last November. However the 1.2 million signatories were left disappointed, as the cartoon introduction simply cut to Travis Scott’s performance. Why was the show controversial? Like most previous performers, Maroon 5 kept their set upbeat and free from politics. The group, which has built a career on inoffensive pop songs and an uncanny ability to adopt new musical trends, was never going to ruffle any feathers – but they arrived at the Super Bowl in a year when the conversation around the half-time show had become particularly heated. There were rumours that some artists – including Rihanna – had refused to perform for the NFL, which has been criticised for its botched handling of player protests and the alleged blacklisting of Colin Kaepernick, who began the practice of kneeling during the US national anthem to raise awareness of racial inequality and police brutality. It meant Maroon 5 had to play the Cardi B duet Girls Like You without their star collaborator, after she declined to appear, citing solidarity with Kaepernick. “There’s a man who sacrificed his job for us, so we got to stand behind him,” she explained earlier this week. Wary of a backlash, Maroon 5 cancelled the traditional pre-game press conference in order to “let their show do the talking”. On Thursday night, however, Levine gave a pre-taped interview to Entertainment Tonight, in which he addressed the situation. “I’m not in the right profession if I can’t handle a little bit of controversy,” he said. To counter criticism, the band teamed up with the NFL and their record label Interscope to donate $500,000 (£382,000) to educational charity Big Brother Big Sister. Their gesture echoed that of Travis Scott, who only agreed to perform on the condition that the NFL agreed to join him in a joint donation of $500,000 to the social justice organisation Dream Corps. None of the performers were paid for playing the Super Bowl; but they receive one of the largest TV audiences on US television. Last year, Justin Timberlake’s mid-game performance was watched by 106.6 million people in the US. The most-watched Super Bowl show of all time was Katy Perry’s shark-infested spectacular in 2015, which drew 120.7 million viewers. Before the clash between The New England Patriots and the Los Angeles Rams began, Gladys Knight gave a powerful and soulful rendition of the National Anthem, flanked by a military band and accompanied by artist and deaf activist Aarron Loggins, who signed the anthem. Knight had earlier issued a defiant statement explaining her decision to appear. “I understand that Mr Kaepernick is protesting two things, and they are police violence and injustice,” Knight told Variety magazine. “I am here today… to give the anthem back its voice, to stand for that historic choice of words, the way it unites us when we hear it and to free it from the same prejudices and struggles I have fought long and hard for all my life,” she added. The Big NBA Mystery: Did A Philly Exec Use Burner Accounts To Trash His Players? May 30, 2018 Comments Off on The Big NBA Mystery: Did A Philly Exec Use Burner Accounts To Trash His Players?